It’s probably safe to say that we all spend more time looking at our mobile and portable devices. As the desktop PC moves rapidly toward extinction, ever-reducing power consumption of electronic devices plus advances in rechargeable battery technology means that portable devices no longer need to be tethered to the AC supply. Power consumption of electronic devices is falling as IC technology improves, however consumer preference is for smaller and lighter devices, with increased feature content, and capable of prolonged usage cycles. The battery contributes significantly to the size, weight and cost of a mobile device, but also determines how long the device can be used before a re-charge is needed. As we become more reliant on our devices, then battery life is becoming increasingly important. Today’s electronic devices are powered by Li-Ion batteries which provide around 2x higher energy density compared to previous nickel based batteries. Li-Ion delivers lower self-discharge rates and does not suffer from memory effect which causes NiCad battery’s capacity to degrade rapidly under certain conditions. Li-ion’s 3.6V cell voltage also means that a single cell can be used in typical applications where 3x nickel based cells at 1.2V/cell were previously needed. Li-ion batteries have other advantages over nickel based cells, they operate with prolonged life, require no maintenance or scheduled charging, and give high reliability when used correctly. However Li-Ion cells are fragile and require careful design considerations. Protection circuits are needed for each battery pack to ensure good battery longevity. Li-ion cells need protection against over-charging, excessive discharge, max and min temperature, and excessive current. Battery cells are mechanically fragile and can fail with dramatic consequences when abused or damaged. A Li-Ion cell’s mAh rating not only determines the storage capacity but also the safe charge and discharged rate “C”. A 1500mAh battery rated at 1C should be charged or discharged at 1500mA and will fully charge / discharge in 1 hour. In comparison, a 2C rated 1500mAh battery can be safely charged or discharged at 3000mA in 30 minutes. Early mobile devices (eg Nokia 3310) were equipped with 1000mAh batteries, A ~3 watt charger (6.5V @500mA gave a maximum charge rate of ~0.8C. At 10 watts, the charge current is 2.8 Amps, and the maximum charge rate is 1.1C. At 15 watts the charge current is 4.2 amps, and the maximum charge rate is 1.6C. Voltage boost is used to solve the 2 Amp limitation of the micro-USB connector. Modern Li based batteries are increasingly capable of charging at higher rates. Novel use of supercapacitors and organic compounds (eg Store-dot) has the potential to increase this further in the future. Increasing battery mAh capacity gives a double benefit of longer battery life while also supporting higher charge current without increasing the charge rate “C”. As charge current increases, then powerful chargers with sophisticated monitoring and protection is needed to ensure that batteries charge reliably and safely. For example, Oppo’s VOOC flash charger advertises “5 layers of built-in protection” to deliver “4x faster charging”. Huawei’s massive 4000mAh battery has the capacity to deliver a “full day’s use from a 30 minute charge” while still maintaining a relaxed charge rate of 1.25C. 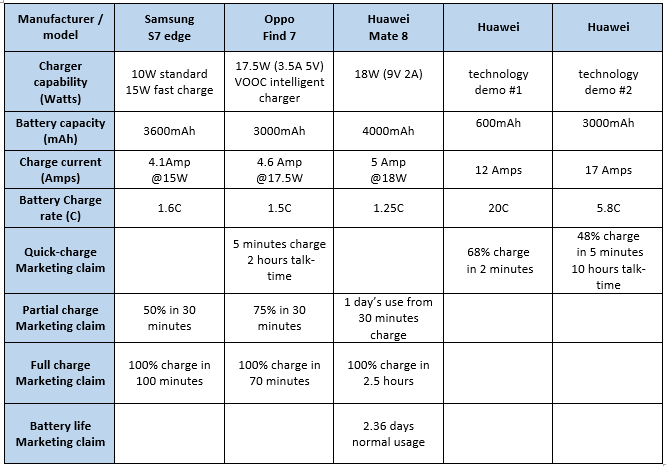 Battery life and re-charge time is becoming an important sales differentiator and is fueling rapid growth for emerging mobile manufacturers as the table below illustrates. Improving battery technology, intelligent monitoring and protection, voltage boost (to overcome the USB micro connector’s 2 Amp limit), and the introduction of the USB type-C connector (5 Amp capability) will continue to demand more sophisticated and powerful chargers in the future. The technology is also scalable, whether it’s a 2Ah phone battery or a 100KWh EV battery or something in-between then quick charging is helping to reduce the downtime associated with re-charging. Tesla is now installing “supercharger” stations that can re-charge their Model-S and Model-X cars from 0% to 80% in 30 minutes. Quoting Tesla’s website … “Tesla is the only EV manufacturer capable of charging vehicles at up to 120 kW, which equates to about 170 miles of range in as little as 30 minutes”. The supercharger stations are conveniently located near to shops, restaurants and wifi hotspots, and Tesla’s app let’s you know when the car is charged and ready to go.